Here my recipe for a duck and mushroom pie. Duck legs are cooked (in the pressure cooker) with triple sec and a bit of orange zest, giving it a mild orange flavor. 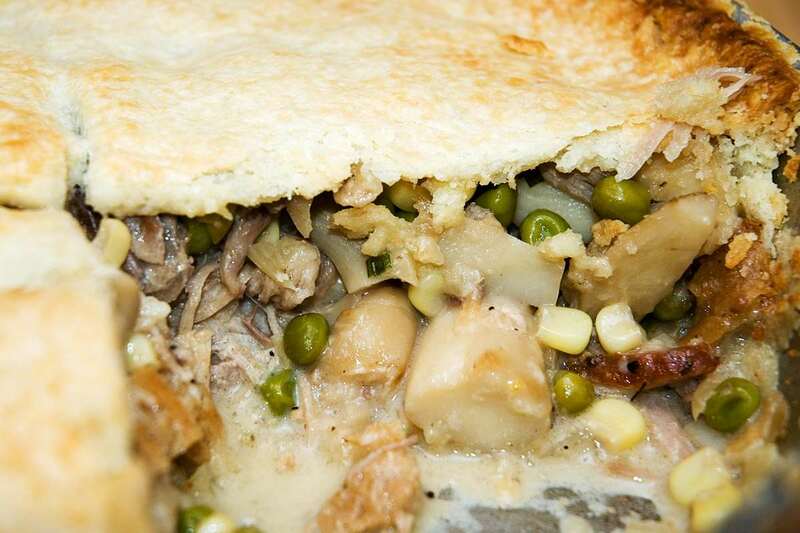 The pie is then filled with the duck meat, peas, corn and bread and baked until golden brown. 1 lb / 450g preferably firm cooking mushrooms (I used trumpet royale mushrooms). Grease a pie pan with butter. Line bottom and sides with a sheet of pie crust dough. Set pressure cooker over high heat. Add vegetable oil. Add duck legs, skin side down. Brown well, turn, brown other side. Reduce heat. Add chopped onion, cook for 1-2 minutes. Add garlic, cook for another minute or two. Add orange zest, chicken stock, triple sec, thyme and salt. Put on lid, cook with high pressure for 35-40 minutes. Release pressure, remove duck legs from pan, take meat off the bones, set aside. Remove orange zest, discard. Degrease the liquid by skimming off the fat. Set aside liquid, discard fat. While the duck legs are cooking, set saute pan over medium-high heat. Add butter (1 tbsp) and olive oil and sugar. Cook until sugar has turned golden brow. Stir frequently. Add chopped onion. Cook until lightly browned. Add mushrooms and salt. Cook for ca. 5 minutes, reduce heat if necessary. Add wine, and chicken stock. Simmer partially covered for ca. 15 minutes until most of the liquid has evaporated. Add corn and peas. Simmer for another 5 minutes (or until tender). Add duck meat and liquid from cooking the duck. Adjust seasoning with salt and pepper. Stir in bread cubes. Fill mixture into pie pan, cover with a second sheet of pie crust, crimp the edges and cut a cross in the center to allow steam to escape. Bake for 10-15 minutes until the crust has turned golden brown. You can of course also use homemade pie crust (I'll publish a recipe soon).